This Feb. 3, 2016, file photo shows officials escorting "Serial" podcast subject Adnan Syed from the courthouse in Baltimore, Md. Adnan Syed, whose murder conviction was the subject of the 2014 true-crime podcast “Serial,” is getting a new trial, the Maryland Court of Special Appeals ruled Thursday. Syed was convicted in 2000 of murdering his 18-year-old ex-girlfriend Hae Min Lee in Baltimore, Maryland, before leaving her in a shallow grave in a local park. Syed was 17 at the time and is now 36. After the highly anticipated ruling, Syed's attorney Justin Brown tweeted: "WE WON THE APPEAL. 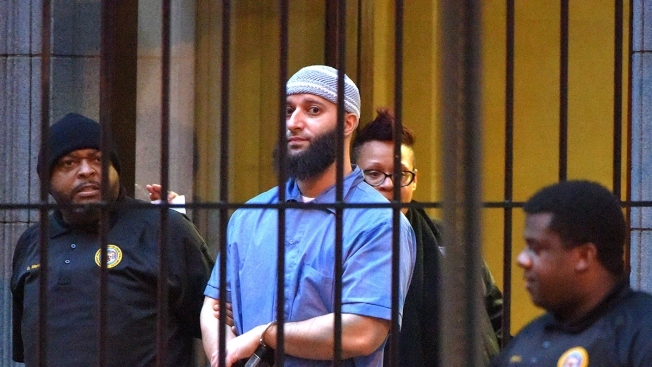 #FreeAdnan"
Syed's case gained international attention when "Serial" focused on it in its first season, becoming the fastest podcast to reach 5 million downloads and streams in iTunes’ history. The show garnered a cult-like following, enthralling listeners with the dramatic twists and turns of Syed’s case. Host Sarah Koenig took the audience to Maryland and traced the very steps Syed is said to have taken before murdering Lee, each episode playing like a real-life murder mystery. Syed has continued to fight his conviction, first appealing in 2012. However, the appeal was denied. A lower court judge then vacated Syed’s conviction in June 2016 after deciding that his defense attorney at the time had not effectively represented him or cross-examined the state on key evidence. The prosecution had used cell phone tower data to place Syed at the scene of Lee's grave when she is said to have been buried. But Syed's trial lawyer, Christina Gutierrez, who has since died, failed to question the state's cell tower expert on the reliability of that data in determining location. With the vacation, Syed was granted a new trial, and after the state appealed that decision, the three-judge panel upheld the decision on Thursday. In a 2-1 ruling, the panel agreed with Syed's current lawyer that Gutierrez failed in another area of the case: investigating a potential alibi witness who said she saw Syed at a public library at the time prosecutors said he killed Lee. That potential witness was Asia McClain, who had written two letters saying she and two others saw Syed. However, Gutierrez never followed up on her account. A special assistant attorney general arguing on behalf of the state had said at a hearing in June that it was not out of the question for Gutierrez to leave out McClain, as she was focused on placing him at his high school during the murder and not at the library. "It's the kind of thing that the defense attorney would have to make a judgment about," the assistant attorney general said. However, the panel said in its written decision Thursday that if testimony from McClain had been presented to the jury, it would have "directly contradicted the State's theory of when Syed had the opportunity and did murder Hae" and could have created reasonable doubt in at least one juror's mind and led to a different outcome. "In considering the totality of the evidence at Syed's trial with the potential impact of McClain's alibi testimony, this Court holds that there is a reasonable probability that, but for trial counsel's deficient performance, the result of Syed's trial would have been different," Chief Judge Patrick Woodward wrote for the majority. Brown credited the viral podcast for helping in this area of Syed's case. "'Serial' kind of shook the trees and that got us to get in contact with Asia McClain," he said. "In that way, 'Serial' was huge." "The wheels of justice are moving in the right direction," another of Syed's attorneys, Christopher Nieto, told reporters Thursday. "Each step, it's tough to get over it but we're making that progress." Brown added that he and his team are ready for a new trial. "If the state is so confident in their case, and if they're so confident that Syed is guilty, they should just try the case. We're ready to try the case," Brown said. They are also considering whether to again seek bail for Syed, who has remained in prison since his 1999 arrest. They had initially sought bail after Syed's vacation but were denied. Prosecutors declined to comment or to say whether they will appeal the ruling to the state's highest court.